It will be an ALL-WILLIAMS Final at the Australian Open! A Williams will win the Australian Open this year! Serena’s serve was much better last night and she dominated Lucic-Baroni 6-2, 6-1. It was all about Venus Williams making the Final last night though! She surely took centrestage. Her match was before Serena’s and must have helped to further inspire and fire up Serena to win her match. Vintage Venus was on the move! It was such a beauty to watch. Quite inspirational. The match started off with Venus being broken in her 1st game and that never occurred again. The 1st set went back and forth with Venus up 6-5. At this point Coco raised the level of her game to force the tiebreak. Venus tightened up during the tiebreak and lost the 1st set. She was visually upset with herself and if looks could kill! She expressed her wrath in the 2nd set with controlled aggression and took it easily, 6-2. Of course at that point, the edge was still given to the younger player, Coco to have enough gas left for 3 sets. But the momentum stayed on Venus’s side with her entering the 3rd set with the same attitude, breaking Coco early. Coco went a bit loco throwing her racquet but she did not go down without a fight. I remember her asking out loud early in the 1st set what was going on. Well by the 3rd set it must have hit her that she was playing the experienced Venus Williams who was one of her 4 idols growing up. The other 3 included Venus’s sister, Serena, Jennifer Capriati and Lindsay Davenport. It has been years since Venus has played like this. I was pleasantly surprised that she pulled this off. She saved 12 of 13 break points faced and scored 11 aces. Her movement was phenominal, she made necessary adjustments such as hugging the baseline to accommodate hard hitting by Coco and beat her mentally. Her serve was clutch and she won 6-7, 6-2, 6-3. It was spectacular tennis by both players. Her winning moment is a must see. The 36 year old could not contain her excitement and emotions. She looked like a 6 year old and deservedly so. She had more twirls going than Serena. Venus hasn’t reached a Grand Slam Final since 2009 and her last Australian Final was in 2003 vs Serena. Here are the stats between the Williams sisters heading into the Final this Saturday at 3am! The Australian Open is heating up! Serena Williams is through to her 10th straight SemiFinal! She beat Konta 6-2, 6-3. It was all mental and she read her opponent well. Despite her poor 1st service games tonight she surely turned up her 2nd and returns! She will meet 34 year old, Croatian Mirjana Lucic-Baroni at 12am later. Serena is chasing 23 Grand Slam Titles to write history but Lucic-Baroni has her own fairytale story, trying to have the biggest comeback in history. They last met at Wimbledon when they were teenagers in 1998 and Serena came out on top. Lucic-Baroni was to be the next big thing back then upsetting Monica Seles to reach the Semi Finals at Wimbledon in 1999. But she drifted from the scene with personal issues, coming out to the public a few years later that she was abused by her father. She has a number of injuries but was in tears of happiness just to make it to the SemiFinals and will surely give everything she’s got. Venus will meet the young power hitter, Coco right now! Will Venus make it an over 30-year old final? Suga favours Coco to win but will be happy if Venus pulls off the win. The Men’s side is also hot. Rafael Nadal beat Milos Raonic in straight sets and is heading to the SemiFinals vs. Dimitrov. We could possibly witness a Nadal-Federer Final! Federer would have to overcome Stan Wawrinka first though at 3:30am, which may not be an easy task. Enjoy and stay tuned! Suga’s got you if you are sleeping. 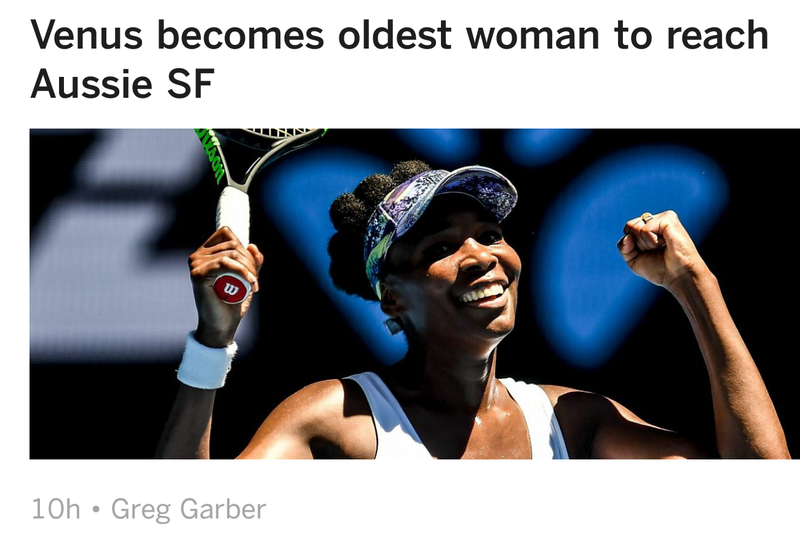 Venus at 36yrs old is through to the Semis as the oldest woman in History to do so at the Australian Open. She will meet the unseeded Coco Vandeweghe and fellow American who has been creating upset after upset, beating #7 Muguruza in straight sets 6-4, 6-0 after knocking out World #1, Angelique Kerber. Coco is a power hitter and she definitely has her eyes on the title. Serena plays #9 Konta tonight at 9pm in the QF who is not a walk over. For the Men, Nadal will face Raonic in the QF tommorrow at 3:30am. Federer (#17) beat Zverev in straight sets and will meet #4 Stan Wawrinka who beat Tsonga in straight sets and stared him down. NFL Sunday and Australian Open Updates! No. 1 seed for the women and Defending Champion, Angelique Kerber was upset and overpowered by no. 35 American Coco Vandeweghe who hit 6 aces and 30 winners. Kerber lost 2-6, 3-6. Does Serena have a better chance of winning her 23rd Grand Slam title now? Too early to say. Muguruza, Venus, Pliskova and more are still in it. The no. 1 seed on the men’s side, Andy Murray was also sent packing. He lost to Mischa Zverev in 4 sets, 5-7, 7-5, 2-6, 4-6. Old veterans and faves Nadal and Federer are still in it though and Federer looks like he is in great shape to win 1 more with Murray and Djokovic out of the way. The favoured Falcons face the Packers today in the NFC Championship at 3:05pm on FOX today. The Falcons injury list is now empty compared to a lengthy one for the Packers. Luckily, ESPN Scorecenter has reported that Wide Receivers, Jordy Nelson, Devante Adams and Geronimo Allison are now active for the game in less than an hour. The favoured Patriots face the Steelers at 6:40pm on CBS for the AFC Championship.